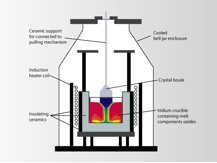 The conventional method of producing high-melting complex compounds from simpler high-melting precursor compounds) is to melt the starting materials together at high temperatures followed by carefully-controlled cooling to produce crystals. For example, Lu2O3 and SiO2 can be melted together at 2050ºC in an iridium (Ir) crucible by induction heating followed by highly-regulated very slow cooling to produce crystalline Lu2SiO5. The process is very expensive, time-consuming, and subject to failure. Lu2O3 and SiO2 are placed in a very-hard ZrO2 cup along with several small very-hard ZrO2 balls. The cup is rotated at 850 rpm. 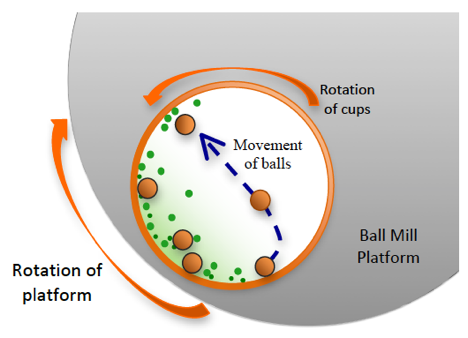 When the balls crash into the walls and into each other, very small spots of high temperature and high pressure are produced. The energy is partially transferred to the Lu2O3/SiO2 mixture, and after 6 hours, complete transformation into Lu2SiO5 has occurred. By alteration of conditions, Lu2SiO5 at μm or nm sizes can be made. Lu(NO3)3, amorphous fumed silica (SiO2) and urea are mixed in water, which is then evaporated to dryness. The resulting mixture is then heated to 300oC, where the NO3- rapidly oxidizes the urea to give a temperature of 1600oC which produces Lu2SiO5 at the 50-100 nm level. 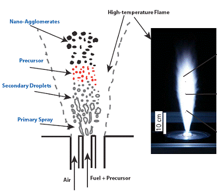 A solution of Lu(NO3)3 and tetraethyl orthosilicate (TEOS) in ethanol is treated with an ultrasonic atomizer and O2, and the stream is passed through a methane-oxygen pyrolysing flame zone. The resultant Lu2SiO5 particles are in the 50-100 nm size range. Dr. Schweitzer earned his B.A. in chemistry from Central College in 1945, his M.S. in chemistry from the University of Illinois in 1946, and his Ph.D. in chemistry from the University of Illinois in 1948. Dr. Schweitzer also earned an M.A. in philosophy from Columbia University in 1959 and a Ph.D. in philosophy from New York University in 1964, and was awarded a Sc.D. for his work in the history of science in 1965. 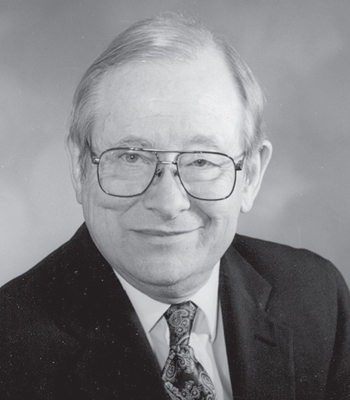 He joined the faculty at the University of Tennessee in 1948 and has done and continues to do research and consult with several of the facilities at Oak Ridge: K-25, Y-12, ORNL, ORAU, AEC, UT-AEC, ARP. Dr. Schweitzer has been the recipient of numerous awards, fellowships, and lectureships, including an NSF Faculty Fellowship (1959-60). Keefer, G.; Grant, C.; Piepke, A.; Ebihara, T.; Ikeda, H.; Kishimoto, Y.; Kibe, Y.; Koseki, Y.; Ogawa, M.; Shirai, J.; Takeuchi, S.; Mauger, C.; Zhang, C.; Schweitzer, G. K., “ Laboratory Studies on the Removal of Radon‑ born Lead from KamLAND's Organic Liquid Scintillator ,” Nuclear Instruments & Methods in Physics Research, Section A: Accelerators, Spectrometers, Detectors, and Associated Equipment (2015), 769, 79‑87. John D. Auxier II*, Andrew N. Mabe,* Stephen A. Young, Jerrad P. Auxier, George K. Schweitzer, “Synthesis and Characterization of Ce+3-doped Amorphous Lithium Tetraborate, Journal of Nuclear Materials Management (2015) volume 18(2), 344-351. L. F. Miller, M. J. Urffer, Andrew. N. Mabe, R. Uppal, D. Penumadu, and George.K. Schweitzer, “Secondary Electron Energy Deposition in Thin Polymeric Films for Neutron/Photon Discrimination,” to IEEE Transactions in Nuclear Science accepted, now online, to be published in July, issue 99 (2014). Mabe, Andrew N.*; Auxier, John D.*, II; Urffer, Matthew J.; Penumadu, Dayakar; Schweitzer, George K.; Miller, Laurence F., “Transparent Lithiated Polymer Films for Thermal Neutron Detection,” Nuclear Instruments & Methods in Physics Research, Section A: Accelerators, Spectrometers, Detectors, and Associated Equipment (2013), volume 722, 29‑33. A. N. Mabe, J. D. Auxier, M. J. Urffer, S. A. Young, D. Penumadu, George K. Schweitzer, and L. F. Miller, “Thin-Film Polymer Scintillators for Thermal Neutron Detection,” Journal of Composites, Volume 2013, Article ID 539060, 8 pages. L. L. Pesterfield, J. Maddox, G. K. Schweitzer, and M. Crocker, “Pourbaix Diagrams in Three Dimensions”, Journal of Chemical Education 89 (2012) 891-899. Indraneel Sen, Rohit Uppal, Matthew Urffer, Dayakar Penumadu, Larry Miller, Stephen Young, Andrew Mabe, Polyester Composite Thermal Neutron Scintillation Films. IEEE Trans, Nucl, Sci.. May, 2012. Andrew Mabe, Matthew J. Urffer, Stephen A. Young, John D. Auxier II, Dayakar Penumadu, George K. Schweitzer, and Laurence F. Miller. Thin Film Polystyrene Composite Scintillatiors for Thermal Neutron Detection and Gamma Discrimination. Nucl. Instr. Meth., April, 2012. I. Sen, A. D. Green, A. N. Mabe, D. Penueadu, G. K. Schweitzer, L. F. Miller, and K. Thomas, “Neutron Scintillation Detectors based on Like-Emitting Polymers, Transactions on Nuclear Science, January, 2012. I. D. Sen, D.; Penumadi. M.Williamson, L. F. Miller, A. D. Green, A. N. Mabe, Thermal Neutron Scintillator Detectyors Based on Poly (2-Vinylnaphthalene) Composite Films. IEEE Trans. Nucl. Sci. 58 (3), 1386-1393, June 2011. George K. Schweitzer and Lester L. Pesterfield. The Aquieous Chemistry of the Elements, Oxford University Press, New York, NY, 2010. Second printing 2011. George K. Schweitzer and Lester L. Pesterfield, THE AQUEOUS CHEMISTRY OF THE ELEMENTS, Oxford University Press, New York, NY, 2010. Kindle Edition.